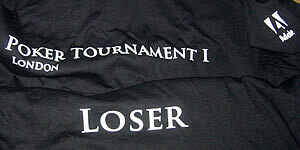 So now the proud owner of a rare (1 of 5) “Poker Tournament I : Loser” tee shirt. But a really fun night just glad it wasn’t real money. Roll on the next one. After a number of years of content-neglect, and problems of client confidentiality, I’ve finally got around to posting up a case-study covering some simple Flash based work samples. (Note: work samples, not code samples). Flash platform case-studies will be being posted more regularly here on in. But kicking off now with three bespoke user-interface elements : A special accordion, a minimal bouncing menu and a HTMLtext text builder. The user-interface elements presented may not set the artistic Flash world on fire, but each represent very specific design solutions. They were also interesting and fun to programme.